If like me you need to lose a few pounds before hitting the beaches this summer your thoughts might be turning towards undertaking some exercise. So get out those walking boots and running shoes or dust down your bike and visit these wonderful Google Maps that allow users to share their favourite tracks and trails. Runstoppable is a free service for runners that acts as a running log, route planner, and group communication tool. Users can draw a route on a Google Map and get mileage information and then share the created map with other runners. Each tracked run comes with its own Google Map. An elevation graph is shown beneath each run. An excellent feature of this map is that if you place your mouse anywhere on the elevation graph that point is shown on the Google Map. 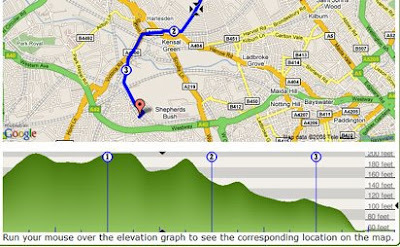 Trailino is a site for users to submit GPS tracks and routes. Each track is shown on Google Maps using the terrain layer and also comes with an altitude profile. Each route can be downloaded as a GPX, KML, Garmin PXC5, Garmin MapSource or as an OziExplorer file. Trailspotting.com uses the Google Maps terrain view to serve up detailed hiking routes in Northern California and the Hawaiian islands. The site also provides a KML link for Google Earth of each hike and free GPS downloads. GPSED allows you to record tracks of your trips anywhere on the Earth from your mobile device. Tracks are traced on Google Maps and stored in an online archive. All you need to start tracking is a mobile device with an internal or external GPS receiver. Each map comes with a whole host of information on the tracked route, including the distance and estimated duration, the average altitude and a detailed description. Buddyway allows users to record trips and journeys via a GPS cell phone. Each trip gets its own Google Map with an accompanying elevation chart. Each trip also comes with detailed information concerning the trip length, the estimated trip time and the average speed. Buddyway has implemented the new Google Earth plug-in so each route can now also be followed in 3D with the terrain feature of Google Earth. Trailguru have over 600,000km of trails mapped. The trails cover a wide variety of activities such as hiking, mountain biking, road biking and mountaineering. Each trail comes with its own Google Map and elevation chart. The additional information provided with each trial covers distance, estimated duration and minimum and maximum elevations. All the trails can be downloaded. Guidevtt is a Swiss site devoted to mountain bike trails. It was among the first Swiss internet applications to offer GPS tracks. Each submitted trail comes with a description page, a statistics page, an energy calculator, a ready to print Google Map and an animated kml for 3D view in Google Earth. Thanks for the great list of trail mapping web sites. A couple of others that I like include mapmyride.com and takitwithme.com. http://www.redtrails.com - the definitive US trails archive.